A big thank you to Peter Ashton for his valiant efforts. Peter’s grandmother Alice Soden had PSP. 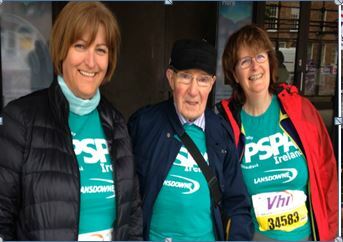 In her memory, Peter cycled the challenging 180Km Ring of Kerry to raise funds for PSPA Ireland. This is his account of the day. “I thoroughly enjoyed my time cycling through the Ring of Kerry on July 2nd in aid of PSPA Ireland. The day began bright at early, setting off at 7:30am in heavy rain. That soon eased off. The first food stop was 60Km in and I was feeling quite good. The morning went on and it was beginning to dry up. The legs were feeling good. The 2nd food stop was at the 105K mark and I stocked up on food. The toughest part was Moll’s Gap, a 9KM ascent up the mountains. Once I reached the summit, it was a fast descent for 5Km reaching speeds of 70Km/h. All in all, it was a fantastic event and I’m glad I raised funds for this fantastic organisation”. RED TIDE Sligo Camino walk raises €500 for PSP. Well done to Ted and the RED TIDE team who left Dromahair on the 2nd July 2016 to walk the 34 K Sligo Camino. They passed the River Bonnet and the striking Creevelea Abbey, founded in 1508 by Owen O’Rourke. Ted loved the forest trail that sweeps the shore of Lough Gill with views of the Isle of Inishfree. He waved to the Sleeping Giant in the distance and stopped for a photo in the silent and beautiful Slish Wood. He climb over limestone pavements to see isolated Lough Lumman. To his great delight, Joan his RED TIDE companion told him stories of Slieve Da Éan, Slieve Dargan and an Caille a Vera. Through Ballygawley Woods grassy verges he walked to Union Wood where he got his passport stamped with Edith his other RED TIDE companion. He marvelled at the great views of the Ox mountain range and Knocknarea with Queen Maeve’s’ Cairn at the top. He thought of those he was walking for, determined to finish he passed the rushing Owenmore and finally the Owenbeg River to arrive in Coolaney. “A challenge worth taking for PSP” RED TIDE. PSPA Ireland would like to congratulate and thank Patrick Doddy and Peter Roche who got married in Donegal August 2016. We hope you had a wonderful day. In July 2016 Patrick and Peter with great generosity of spirit and love for a close relative living with PSP set up a fundraiser on PSPA Irelands fundraising page. They asked people to donate to PSPA Ireland instead of giving them gifts. Sadly in the interim their Aunt Pauline did not survive but I’m sure she would be impressed and very proud of such a thoughtful and kind gesture. We wish them much happiness now and far into the future. If you are planning a fundraiser please contact us in advance of setting up your page. 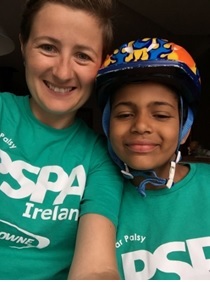 In May 2015 Tameen and Alison donned their PSPA Ireland T-Shirts to raise awareness and joined 17,000 cyclists in the 21K Tour la Nuit through the streets of Montreal, Quebec. T-shirt on again, Alison also cycled a 50k in Montreal. This was a tough cycle in the wind and rain and in Alison’s own words “I felt like I was on a stationary bike half the morning”. The Colour Run is a great fun event founded to celebrate happiness, health, individuality and community. At each kilometre participants are doused in a safe washable colour. 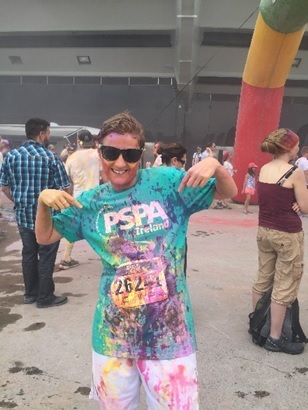 Alison wearing her PSPA Ireland T-shirt ran the Montreal 5K Colour Run to raise awareness of PSP. 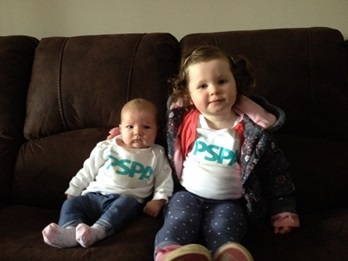 Alison Slattery has been raising awareness about PSP since her uncle John Joe Naughton was diagnosed. You can read John Joe’s story on our site at this link. 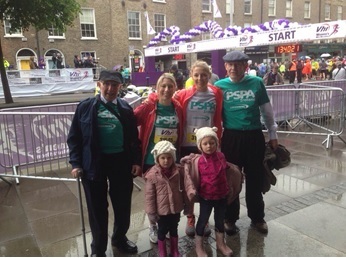 Alison’s family have been great supporters of PSPA Ireland since it began. 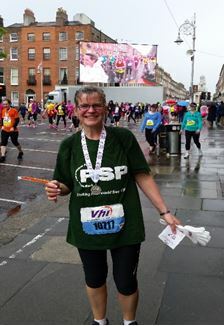 Alison who lives in Canada rang us for some t-shirts and has been raising awareness by wearing the PSPA Ireland t-shirts ever since. We are all so proud of the fantastic job she is doing raising the profile of PSP. Thank you Alison for you generosity of spirit and commitment to people with PSP & CBD. 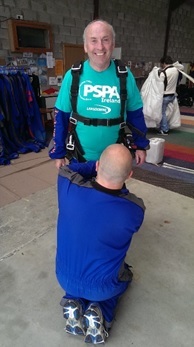 William McNevin takes to the sky for PSPA Ireland. Skydiving is a risky sport so I couldn’t wait to talk to William Mc Nevin about his adventure. William kitted up for his tandem skydive in Co. Offaly. Speaking to him after the jump he said,” It was fantastic, I want to go up again”. He described his touch down as like landing on a soft pillow. I was really impressed. 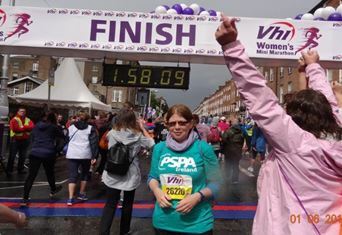 William got his friends and family to sponsor him and he donated the proceeds to PSPA Ireland so that we can continue our work for people with PSP and CBD. Thank you William and Well Done. 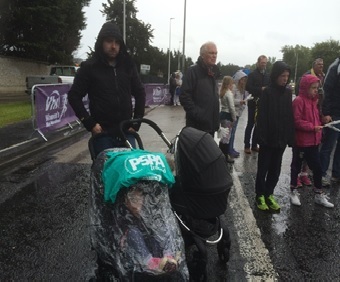 It was wet and windy but that didn’t stop the fantastic people that came out to support PSPA Ireland. 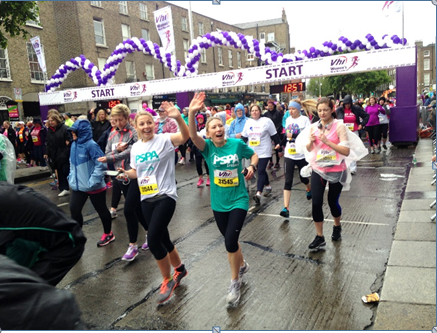 Well done to all the wonderful women who braved the elements to run or walk this year. We would like to thank everybody who took part for their support and enthusiasm and the families and supporters who stood in the rain to cheer us on. On behalf of all our members who struggle with PSP and CBD, their careers and families we thank you and well done. Hats, coats and beautiful bunnies- all geared up for action at the 2015 VHI Women’s Mini Marathon How cute is this?